Sarah Nader- snader@shawmedia.com Eighth-grade students from Parkland Middle School, Colin Kempsell (left), 14, Matt Borst, 13, Madison Schutze, 13, and Grace Knudsen, 14, react after answering their last question correctly while competing in the 27th annual Scholastic Bowl at Hannah Beardsley Middle School in Crystal Lake Friday, May 9, 2014. 19 schools throughout McHenry County came to compete against each other in areas of Mathematics, Science, Language Arts and Social Studies. The Parkland Middle School students finished in first place. 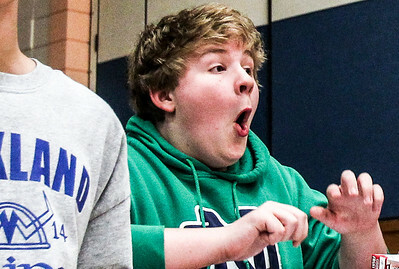 Sarah Nader- snader@shawmedia.com Eighth-grade student from Parkland Middle School, Matt Borst, 13, reacts after his team answered their last question correctly while competing in the 27th annual Scholastic Bowl at Hannah Beardsley Middle School in Crystal Lake Friday, May 9, 2014. 19 schools throughout McHenry County came to compete against each other in areas of Mathematics, Science, Language Arts and Social Studies. The Parkland Middle School students finished in first place. 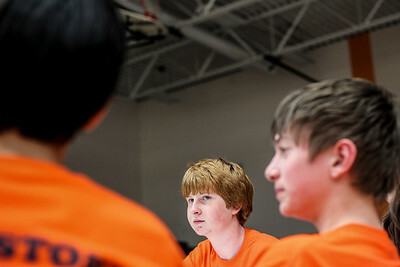 Sarah Nader- snader@shawmedia.com Eighth-grade student from Hannah Beardsley Middle School, Matthew Tremblay (center), 14, listens to other schools questions while competing in the 27th annual Scholastic Bowl at Hannah Beardsley Middle School in Crystal Lake Friday, May 9, 2014. 19 schools throughout McHenry County came to compete against each other in areas of Mathematics, Science, Language Arts and Social Studies. The top three teams received trophies. 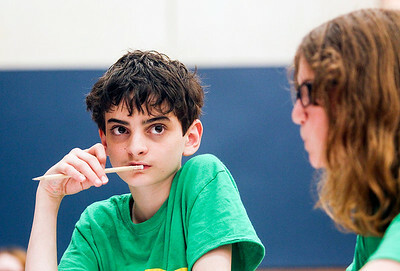 Sarah Nader- snader@shawmedia.com Eighth-graders from Cary Junior High School, Liam Price (left) 13, and Gretel Chikos, 11, think about their answer while competing in the 27th annual Scholastic Bowl at Hannah Beardsley Middle School in Crystal Lake Friday, May 9, 2014. 19 schools throughout McHenry County came to compete against each other in areas of Mathematics, Science, Language Arts and Social Studies. Parkland Middle School students finished in first place. 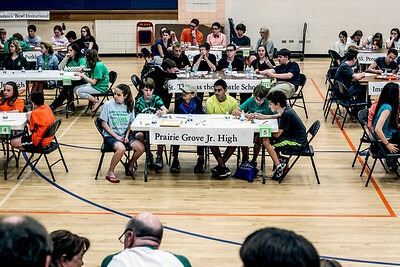 Sarah Nader- snader@shawmedia.com Students look at their teams score during a break while competing in the 27th annual Scholastic Bowl at Hannah Beardsley Middle School in Crystal Lake Friday, May 9, 2014. 19 schools throughout McHenry County came to compete against each other in areas of Mathematics, Science, Language Arts and Social Studies. The top three teams received trophies. 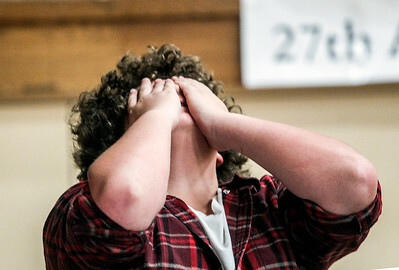 Sarah Nader- snader@shawmedia.com Eighth-grade student from Northwood Middle School, Dylan Martinez, 14, reacts after his teams wrong answer while competing in the 27th annual Scholastic Bowl at Hannah Beardsley Middle School in Crystal Lake Friday, May 9, 2014. 19 schools throughout McHenry County came to compete against each other in areas of Mathematics, Science, Language Arts and Social Studies. The top three teams received trophies. Sarah Nader- snader@shawmedia.com Eighth-grade students from Northwood Middle School, Dylan Martinez (left), 14, and Albert Muci, 14 react after coming up with the right answer while competing in the 27th annual Scholastic Bowl at Hannah Beardsley Middle School in Crystal Lake Friday, May 9, 2014. 19 schools throughout McHenry County came to compete against each other in areas of Mathematics, Science, Language Arts and Social Studies. The top three teams received trophies. Sarah Nader- snader@shawmedia.com Eighth-grade students from 19 schools throughout McHenry County compete against each other in areas of Mathematics, Science, Language Arts and Social Studies at the 27th annual Scholastic Bowl at Hannah Beardsley Middle School in Crystal Lake Friday, May 9, 2014. Sarah Nader- snader@shawmedia.com Eighth-grade students from Hannah Beardsley Middle School, Shannon Batling (left) 13, and Caleb Jensen, 14, listen to other schools questions while competing in the 27th annual Scholastic Bowl at Hannah Beardsley Middle School in Crystal Lake Friday, May 9, 2014. 19 schools throughout McHenry County came to compete against each other in areas of Mathematics, Science, Language Arts and Social Studies. The top three teams received trophies. 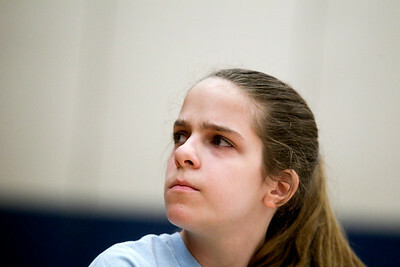 Sarah Nader- snader@shawmedia.com Eighth-grade student from Prairie Grove Jr. High, Bailey Schneyr, 13, waits for there verdict after her team answered a science question while competing in the 27th annual Scholastic Bowl at Hannah Beardsley Middle School in Crystal Lake Friday, May 9, 2014. 19 schools throughout McHenry County came to compete against each other in areas of Mathematics, Science, Language Arts and Social Studies. The top three teams received trophies. 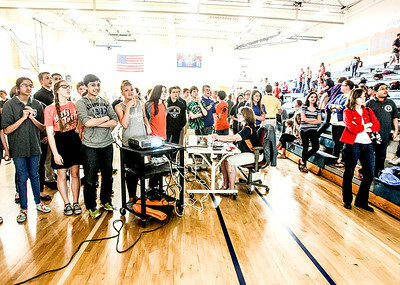 Eighth-grade students from Parkland Middle School, Colin Kempsell (left), 14, Matt Borst, 13, Madison Schutze, 13, and Grace Knudsen, 14, react after answering their last question correctly while competing in the 27th annual Scholastic Bowl at Hannah Beardsley Middle School in Crystal Lake Friday, May 9, 2014. 19 schools throughout McHenry County came to compete against each other in areas of Mathematics, Science, Language Arts and Social Studies. The Parkland Middle School students finished in first place.